Think Critically. Transform Practice. Promote Justice. * The following is adapted from the work of Michael Fullan, John Hattie, the BC Education Plan, the Ontario Education Strategy, Douglas County School District, the Center for Individual Opportunity, and more. Most people agree that our education system is a good one. Teachers are skilled, facilities are sound and students succeed. Yet an education system designed in the very different circumstances of an earlier century can’t possibly always meet the challenges students face – both now and in the future. In the social, economic and technological environment of the past, change was much more gradual than it is today. Many of the opportunities and jobs we’re preparing our students for don’t even exist today. So while we enjoy a strong and stable system, we need a more nimble and flexible one that can adapt more quickly to better meet the needs of 21st century learners. We’ve all got a stake in preparing our young people for success in a changing world. Our challenge is clear. The world has changed and it will continue to change, so the way we educate students needs to continually adapt. Children are natural born learners, and teachers are passionate about teaching. We have a unique opportunity to forge that common ground toward a more innovative education system that meets the needs of our families today and in the future, to keep our young people achieving and thriving in a dynamic, rapidly changing world. To do this we need to build on the many strengths of our existing education system while modernizing education so it can adapt and respond to students’ needs. Having high quality schools starts with deeply supporting our teachers and administrators. Implementing this model well will result in better teaching and improved student learning throughout our system. We can and must make education more flexible so students and families benefit from the exciting knowledge economy we’re part of. To do that, students must be at the center of a more personalized approach to learning and our schools must be more adaptable in responding to student needs. Each dot represents an individual, and each axis represents some variable. This typical approach to understanding correlations looks for the ‘average’ behavior or outcome. But in my view this misguided approach has created what research calls, and what many school systems have become as a result No Child Left Behind’s narrowing of curriculum, the ‘culture of the average’. For example, far too often in education when someone asks a question such as, “How fast can a child learn how to read in a classroom?”, educational systems change that question to “How fast does the average child learn to read in the classroom?”. We then ignore the children who read faster or slower, and tailor the classroom toward the ‘average’ child. If we focus the system merely on what is ‘average’, we will remain merely ‘average’ and in doing that destroy the talents of the students we are charged to serve. Despite the diversity of our society, and the economic necessity of developing more talent, our educational institutions remain firmly committed to the ‘average’. The way we design educational materials, structure learning environments, assess learning, measure intelligence, hire employees, and evaluate performance; all of it is based on the ‘myth of average’, and none of it is based on insights about real-life individuals or the fact that scientifically and mathematically we have shown that ‘averages’ rarely tell you about individuals. For at their best, ‘averages’ represent a small percentage of people; at worst, they are artifacts that literally represent nobody. 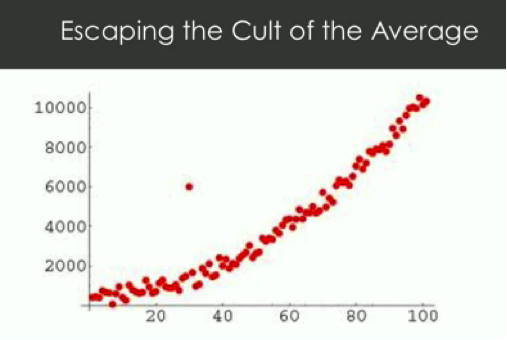 The simple fact is that if our goal is to understand individuals, ‘averages’ will not work. Instead of focusing on the ‘average’, it is my belief that we must build a system of opportunity focused on the individual potential of each of our students. Our work is not centered on moving students up to the ‘average’ but instead focused on moving the entire ‘average’ up in all of schools across the district by banning ‘average’ thinking and demanding we design our learning environment to the edges of student potential, nurturing and growing each and every one of our students. This Plan builds on the strengths of our existing system while moving to adaptable education for the world of today and tomorrow. New policy direction will be required for some of these changes, while others can be made through collaboration and engagement with all education partners. For all students, reading, writing and math skills will still be emphasized and students will still be required to meet core learning outcomes. Our students have a strong track record of success in state, national, and international measures of these skills and this Plan will build on that success. While a solid knowledge base in the basic skills will be maintained, to better prepare students for the future there will be more emphasis on key competencies like self-reliance, tenacity, critical thinking, creativity, problem solving, innovation, teamwork and collaboration, cross-cultural understanding, and technological literacy. We can also connect students more directly with the world outside of school, with increased focus on learning these skills across topic areas. Students’ progress will continue to be monitored through rigorous district-wide assessments. Effective classroom assessment practices are key to student success and will be even more vital in a more personalized learning environment. Educators will have more ability to decide how and when each student is assessed. New tools will be developed to provide greater access, richer information, and more consistency across the district on student progress. Regular reporting to parents both formally and informally will remain key. A great teacher has always been the key to creating outstanding educational experiences. Under this Plan, this will continue. To help students succeed in a rapidly-changing world, teachers will be empowered to shift from being the primary source of content to focus on helping students learn how to learn. This Plan will make it easier for teachers to use their professional knowledge and discretion to guide students toward the skills and knowledge that will help them thrive in later life. By having the curriculum built around fewer but higher level outcomes, this plan gives teachers and students more time and flexibility to explore student’s interests and passions. Students, parents and teachers all need the teaching profession to be administered in a way that ensures high standards and puts the public interest first. To achieve these goals, this Plan will address widely-shared concerns about how our teaching profession has been regulated. It will make sure teacher regulation protects both students and the public interest. It will also ensure teachers get regular, meaningful feedback to inform how they teach. This Plan opens the door for new ways of learning – not just for students, but for teachers as well. Under this Plan schools will gain new flexibility to design programs that really work for all students. There will be more flexibility and choice regarding how, when and where learning takes place, and there will be more flexibility about how students are organized for learning. Choice options and focus programs will continue to be options for parents and students. This Plan will give students, families and educators more say on how, where, when and what students will learn. In many cases, the way classes and schools look might change. School and daily calendars may change if supported by the board and community as benefitting students. Almost certainly, more learning will take place outside of the school setting. This Plan is based on a simple principle: every learner will realize their full potential and contribute to the well-being of our world. 3) Capacity for innovation (Knowledge building and innovation). These areas are interrelated and will collectively play a critical role in our successful journey from good to great and the ways that we continually adapt, improve and changes over time. All initiatives and activities within the Plan’s implementation strategy, detailed below, are anchored within these three key areas. While the overall Plan strategy is built upon the theory of action just described, there are seven key components or actions which form the building blocks for its implementation. Personalized learning for every student is the goal of the Plan. A close examination of our current Key Performance Indicators must guarantee that they are centered around goals that challenge us to design to the edges–ELL, SPED, TAG, Students in Poverty, ACT College Readiness, etc. For under this Plan, teachers, students and parents will work together to make sure every student’s needs are met, passions are explored and goals are achieved. This means student-centered learning that’s focused on the needs, strengths and aspirations of each individual young person. Students will play an active role in designing their own education and will be increasingly accountable for their own learning success. It’s all about putting students at the center of education. That means giving teachers and schools the flexibility to make sure each student is well served by their educational program. Each student is unique and our education system will support each student’s interests and nurture their talents. • Key Performance Indicators will be redesigned to reflect the core competencies, skills, and knowledge that ALL students need to succeed in the 21st century–rejecting traditional “aggregate-then-analyze’ measures to pursue an “analyze-then-aggregate” focus of key performance indicators in which the starting point is patterns of individual variability. • A powerful real-time data dashboard will be available to all employees within the Bend-La Pine Schools to support our effort to increase flexibility for our schools, through a balance of autonomy with accountability. We are drowning in data while starving for information as we have large amounts of data that is all over the place–ACT scores, state assessment results, student attendance, EBISS early warning data/tipping points, staff attendance, transportation routes, fiscal and countless other data pints. We will put all data points into a SQL server and use Tableau to visualize the data allowing every single employee in the district to have access to see the data that effects them on a daily basis. From the beginning, central leadership, especially the board of directors and senior leadership, must be committed to the same ends. For top down guidance is essential in communicating the vision, monitoring progress, financing high-leverage programs and initiatives, and helping the system to stay the course relative to the core priorities and avoid distractors. The relationship between a board and superintendent establishes a tone for the district environment. If the relationship is collaborative and harmonious district employees feel secure as roles are clarified, expectations are clear, and ambiguity does not cloud attempts to change and improve programs. Conflict between the superintendent and board creates tension inside the district and in the community. The situation discourages program innovation and reform, and deters constructive community involvement in the schools. • The board of directors will consistently produce high-impact governance through their governing activities, setting clear strategic directions and funding priorities, fashioning policies that provide boundaries for operations, rigorously monitoring educational, financial, and superintendent performance, and building close, positive ties with key stakeholders in the community. • The board and superintendent will focus on developing a strong working relationship as they are the two most important members of the district’s strategic leadership team, whose continuous, close, creative collaboration is essential in our district’s longterm success. Neither partner making up this strategic leadership team can go it alone. The superintendent not only needs the board’s input in making complex, high stakes decision involving significant longterm impacts, but the superintendent also needs the legitimacy, authority, and support of the board in carrying out these decisions. And, of course, the board depends heavily on the superintendent’s detailed planning and management in carrying out its directions and policies. We—not we/they—is at the heart of effective district leadership. What students know and what they are expected to learn with respect to knowledge and competencies is reflected in a strong core curriculum. Student performance with respect to standards will be key to moving forward. Student progress will be reported to parents in a more meaningful, effective and consistent manner across the district, enabling parents to play a key role in shaping their children’s education. Development of what it means to be a responsible citizen, and a deep sense of connection to the Bend-La Pine community. • We will ensure our standards remain relevant and robust so that every graduate has every advantage to succeed in life. We will build on basic core curriculum skills but also make sure that students are well-versed in the competencies they need to succeed, like critical thinking and teamwork, through the implementation of a guaranteed and viable 21st century curriculum with fewer but higher level outcomes will create time to allow deeper learning and understanding for all students. This guaranteed and viable curriculum will be supported through the systemic implementation of Atlas, an easy-to-use software system which promotes best-practice in curriculum mapping and implementation by providing all school staff ready-access to all curriculum outlines, abstracts, resources, standards, and more across the district. • All assessment activities, whether district-wide or classroom-based, will support ongoing student learning. Our district assessment programs will be reviewed to ensure they focus on key competencies and critical skills and knowledge. Classroom assessment tools, including performance standards and other assessment support material, will be developed with educators. The Plan acknowledges the complexity of the teacher’s role. Teachers will receive support as they continue to adjust their roles to match what students need, moment by moment, to design personalized education that opens the door to educational success for our young people. Professional standards will be high, and we will continue to support our new teacher evaluation and compensation systems. • We will work with our education partners to make sure that job-embedded professional development is used to enhance educators’ knowledge base and professional expertise. It is important that teachers are able to refresh and develop new practices throughout their careers by participating in professional learning opportunities. On School-Improvement days, parents make alternative arrangements for their children and they need to be assured that these days are used as intended. • We will continue to work with universities to ensure teacher preparation programs give new teachers the knowledge and skills they require to support student learning through the development of a series of Professional Practice Schools that employ an co-teaching pre-service model. • We believe mentoring is key to supporting teachers’ professional learning, both in their formative years and throughout their careers. Teachers will have increased access to learning opportunities by working with teacher mentors and each other. • We will work collaboratively with educators, to continue to support our new evaluation system with the goal or regular, quality feedback to teachers that will help focus their professional development opportunities. This feedback will include the use of video and student survey information to increase the practical and powerful nature of our feedback systems for educators. • We will work collaboratively with educators, to continue to support our new compensation systems with the goal to raise the stature of the teaching profession and increase public confidence in the profession. If there is one concept that captures the centerpiece of this Plan’s strategy, it is capacity building. Capacity building has been a long-term focus in our district that must continue to be strengthened. The district has made major investments in personnel but will continue to resource this expectation. • We will need to continue to find creative ways to increase leadership opportunities throughout our district–ICCLs, coaches, mentors, interventionist, etc. • We will need to continue to find creative ways to increase professional learning opportunities for all employees. • In the spirit of comprehensive redesign, it is nearly impossible to change our curricula, assessments, teaching, classroom management and student advocacy, and not reimagine our leadership expectations for administrators. We know that it is only through quality leadership that we will collaboratively reinvent our profession. That is why we will work with our administrators to develop new leadership expectations when creating our leadership evaluation tool. This Plan will mean more choice for students and families with respect to how, when and where learning takes place. To accomplish this schools and programs will also have more flexibility to organize classes and other learning experiences so they can better direct resources to support student learning. Schools will also have more flexibility to vary the school calendar to better meet their student needs. Students will continue to create blended learning opportunities through online learning and class-based environments. Enrolment in online courses has grown by more than 500% in the las five years. • The board of directors will support creative use of school calendars and daily schedules for schools to better meet the needs of their community. • Parents and students will have increased choice and opportunity to decide which school their child attends within our district through strategic boundary, transportation, and instructional programming decisions and supports. • We will create better opportunities for parents to engage in their child’s learning with more flexibility and choice with respect to what, how, when and where their child learns. • We will expand our current learning credential program to better recognize learning that takes place outside of the classroom – like arts, sports, science and leadership programs – so that students are fairly acknowledged for this work. Our district leads the state in the effective implementation of instructional technology for learning. This Plan will continue to encourage smart use of technology in schools, better preparing students to thrive in an increasingly digital world. Students will have more opportunity to develop the competencies needed to use current and emerging technologies effectively, both in school and in life. Educators will be given the supports needed to use technology to empower the learning process, and to connect with each other, parents, and communities. Schools will have a full digital conversion to support learners and educators. • Learners, educators and families will have improved access to digital tools and resources that support both face-to-face and online learning. • The district will promote the use of technology for both students and educators. • An improved district student information and reporting system will help teachers plan a more personalized learning experience with students and their parents. Under this Plan, ours will be an education system that’s more flexible, dynamic and adaptable, to better prepare students for a bright future. We’re not alone in recognizing the need for change. Parents, school systems, and governments around the world are re-examining how their education systems are designed and they are working to make them more responsive to the kind of learning children need now, and what they will need in the future. The way to get from good to great is through personalized learning, supporting teachers, creating more flexibility and choice for families, maintaining high standards and embracing technology. It is an opportunity for every child, every student, every learner to do their very best in education. Working with our education partners, and in consultation with the public, we will get from good to great as we bring personalized learning into classrooms. And we invite all of our community to get involved in this exciting transformation.